Our service team is available 24 hours on 24 hours, 7 days a week on the road to go directly to your workplaces. Our technicians are among the best in their field and are continually being trained to keep up with new developments in forklift trucks. 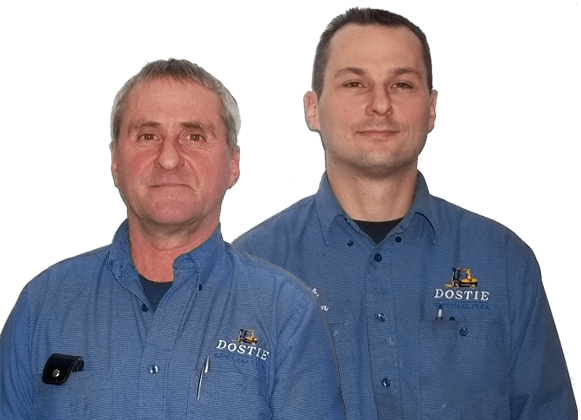 Over the years, Dostie Spécialités has developed a planned maintenance agreement for its customers which is the envy of our competitors. First specialists for nearly 40 years in equipment handling, with the years, we specialized in forklifts and truck crane with material and lifting platform. Our team of workshop technicians is empowered to carry out all types of work such as tire pressing, gas analysis, hydraulic hose manufacture, truck lift truck repair (Moffet). Reassembly of motor or transmission.